Begun in 1951 by monks at the abbey of La Pierre-qui-Vire in Burgundy, the Zodiaque publications consisted of a triennial journal and multiple series of books, including the most famous: La Nuit des temps. The editors’ goal was to renew sacred art for twentieth-century viewers by making connections between the direct, “primitive” character of pre-Gothic religious art and an emerging modernist aesthetic. Focusing almost exclusively on Romanesque architecture and sculptural decoration, Zodiaque revived the style’s richness and variety, bringing to light monuments lost to popular currency and visually shaping their reception with a new eye to graphic forms. What captured the public imagination and brought the Zodiaque books to international attention was their primary feature: striking black-and-white photogravures. These powerful images went beyond documentary photography to become collectible graphic prints, shaping the plastic form seen by the camera into a fresh two-dimensional artwork. 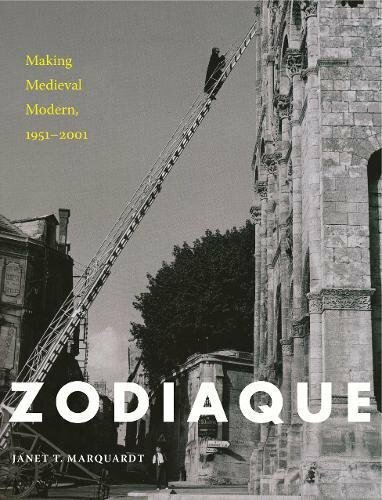 In Zodiaque, Janet Marquardt explores the motivations, philosophies, and workshop practices of Éditions Zodiaque and how they affected the scholarly discourse on medieval art and architecture.